Whether we are damp proofing a large commercial property or damp proofing the smallest of domestic properties, the principal is the same. 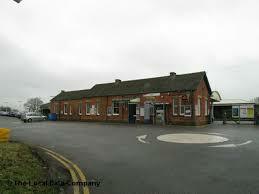 On this occasion we were asked by NetWork rail to damp roof another of their Victorian Stations, this time in Hook, Hampshire. We were advised that the waiting room was being affected by damp, which was damaging the wall plaster and joinery and making it very unsightly. One of our Property Care Association (PCA) qualified damp and timber surveyors attended the Station and inspected the areas of concern, taking moisture readings to the walls, using a calibrated moisture meter in surface (pin) mode to record the correct level of moisture and the height it was rising to. The wall plaster was then examined which confirmed it contained hygroscopic salt, brought from the ground by Rising Damp. Our detailed report was issued to our clients, together with our floor plan and recommendations showing which walls were affected. Following our clients instructions to carry out the work, our experienced, trained operatives protected other areas of the Station before commencing the remedial work, The specified skirting boards and the defective wall plaster were removed, up to a height of 1.2 metres and taken to a designated place for disposal. A pattern of holes were drilled into a selected mortar joint and the base of the wall and vertically were required and then cleared of dust and injected with a Silane/Siloxane cream damp proof course solution at the approved rates, to form a new damp proof barrier The exposed walls were then prepared and re-plastered in accordance with our damp proofing specification. The skirting boards were replaced to match existing and primed in preparation for our clients decorators to finish. Damp proofing should only be carried out by a reputable specialist such as Tapco HomeDry who since 1971 has treated thousands of both domestic and commercial properties for damp and timber rot problems, all of which were covered by our 20 Year Guarantee and protected by Guarantee Protection Insurance (GPI), If NetWork rail trust us to damp proof their Stations, you can trust us to damp proof your home, so call us first.